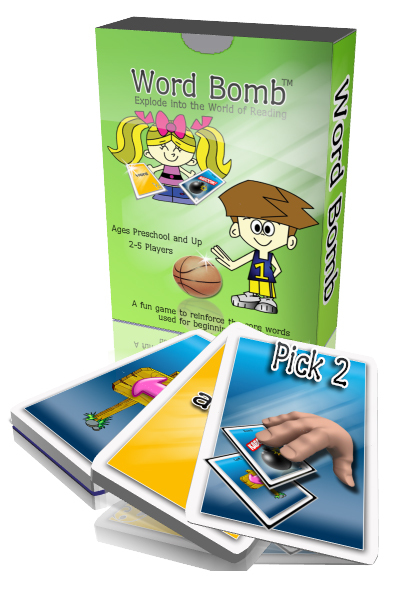 Word Bomb from sggc Learn Laughing is an attempt at a simple, educational card game for recognizing a few words in English. The deck has a bunch of words and a bunch of special cards. Drawn some of them and drop them on the table. Then, in turn, pick a card, and if you can pronounce the word on it (“after”, “done”, …) you keep the card. Otherwise, you throw it back. That COULD have resulted in rewarding the player who does best with a win. However, the “special cards” not only cause you to lose your turn, they also require you to lose all of your cards, or have each player pass all of his or her cards to the player on the left or right, and so on. Which means that the winner is nearly entirely random.